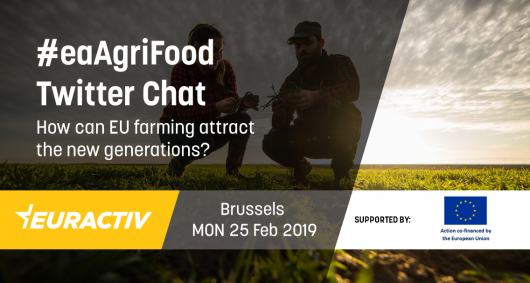 #eaAgriFood Twitter chat: How can EU farming attract the new generations? The discussion about the generational renewal of EU farming has taken centre stage in Brussels, especially in the talks about the post-2020 Common Agricultural Policy (CAP). According to European Commission data, around 22.2 million people work on 10.3 million farms in the EU agriculture sector. While the average age of farmers was 49.2 years in 2004, it rose to 51.4 years in 2014. There were 10.3 million people working as farm managers in the EU in 2016. The average age of farmers is very much at the older end of the age spectrum; one third (32%) of farm managers in the EU were 65 years old or more. Only 11% of farm managers in the EU were under 40. However, there are differences among the 28 member states. Analysts warn that the lack of young farmers could negatively affect future EU competitiveness and food production. Q1 What are the main challenges the new generation faces when attempting to enter EU farming? Q2 Why is the new generation necessary for EU rural areas and farming? Q3 Is the new CAP proposal ambitious enough to bring young people back to rural areas? Q4 Do new technologies have a role to play in attracting young people to farming? Q5 How can the media promote living in rural areas across Europe? @potato_market - The first online potato market for producers and buyers.